In an attempt to combat a ballooning oil glut and dramatically plummeting prices, the premier of Alberta Rachel Notley introduced an unprecedented measure at the beginning of December when she is mandating that oil companies in her province cut production. This directive was particularly surprising in the context of Canada’s free market economy, where oil production is rarely so directly regulated. Canada’s recent oil glut woes are not due to a lack of demand, but rather a severe lack of pipeline infrastructure. There is plenty of demand, and more than enough supply, but no way to get the oil flowing where it needs to go. Canada’s pipelines are running at maximum capacity, storage facilities are filled to bursting, and the pipeline bottleneck has only continued to worsen. Now, in an effort to alleviate the struggling industry, Alberta’s oil production has been cut 8.7 percent according to the mandate set by the province’s government under Rachel Notley with the objective of cutting out around 325,000 barrels per day from the Canadian market. Even before the government stepped in, some private oil companies had already self-imposed production caps in order to combat the ever-expanding glut and bottomed-out oil prices. Cenovus Energy, Canadian Natural Resource, Devon Energy, Athabasca Oil, and others announced curtailments that totaled around 140,000 barrels a day and Cenovus Energy, one of Canada’s major producers, even went so far as to plead with the government to impose production caps late last year. So far, the government-imposed productive caps have been extremely successful. In October Canadian oil prices were so depressed that the Canadian benchmark oil Western Canadian Select (WCS) was trading at a whopping $50 per barrel less than United States benchmark oil West Texas Intermediate (WTI). 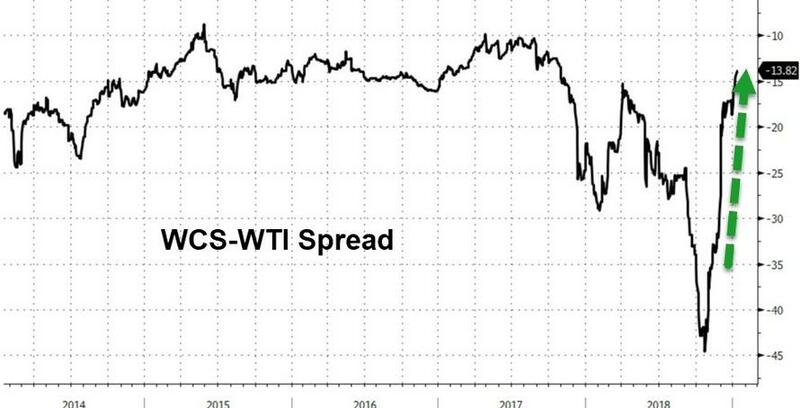 now, in the wake of production cuts, the price gap between WCS and WTI has diminished by a dramatic margin to a difference of just under $13 per barrel. While on the surface this would seem to be a roundly glowing review of the production caps in Alberta, production cuts are not a long-term solution for Canada’s oil glut woes. The current production caps in Canada are only intended to last through the middle of this year, at which point Canadian oil companies will be permitted to decrease their cutbacks to just 95,000 barrels per day fewer than the numbers from November 2018’s production rates. The cuts are a just a treatment, not a cure, for oversupply in Alberta. The problem needs to be addressed at its source--the pipelines. Unfortunately, the pipeline shortage in Alberta has no quick and easy fix. While there are multiple major pipeline projects underway, the two largest, the Keystone XL pipeline and the Trans Mountain pipeline, are stalled indefinitely thanks to legal woes and seemingly endless litigation. The Enbridge Line 3 pipeline, intended to replace one of the region’s already existing pipelines, is currently under construction and projected to be up and running by the end of the year, but will not go a long way toward fixing the bottleneck. Even if the Albertan government re-evaluates the present mid-2019 expiration date for the current stricter production cuts, extending the production caps could have enduring negative consequences in the region’s oil industry. Keeping a long-term cap on production in Alberta would potentially discourage investment in future production as well as in the infrastructure the local industry so sorely needs. According to some reporting, the cuts will not be able to control the gap between Canadian and U.S. oil for much longer anyway, just another downside to drawing out what should be a short-term solution. The government will need to weigh the possible outcomes very carefully as the expiration date approaches, when the and the pipeline shortage is still a long way from being solved and the price of oil remains dangerously variable.